I have penciled in the the new support level of 16,600 for the Dow. This was the previous resistance level and the reversal of roles is an important concept in technical analysis. But always use time and percentage filters to confirm the breakout. On a time basis, if the Dow can hold above 16,600 for two days we have a new support level. It was a strong day for the Dow in terms of the price action: closed near the high of the day. On a volume basis, the volume was relatively low on the breakout. This could raise concerns because volume is the fuel that will drive the advance in an index or stock. But volume is not necessary to confirm a downtrend. A stock can fall with it own weight and relatively small volume. I have concerns with the momentum indicators that I will elaborate on in another post. As you can see, there is no sure thing in technical analysis. Just assigned probabilities. Enjoy your trading day. If you don’t enjoy your avocation or vocation, then it is not worth doing. 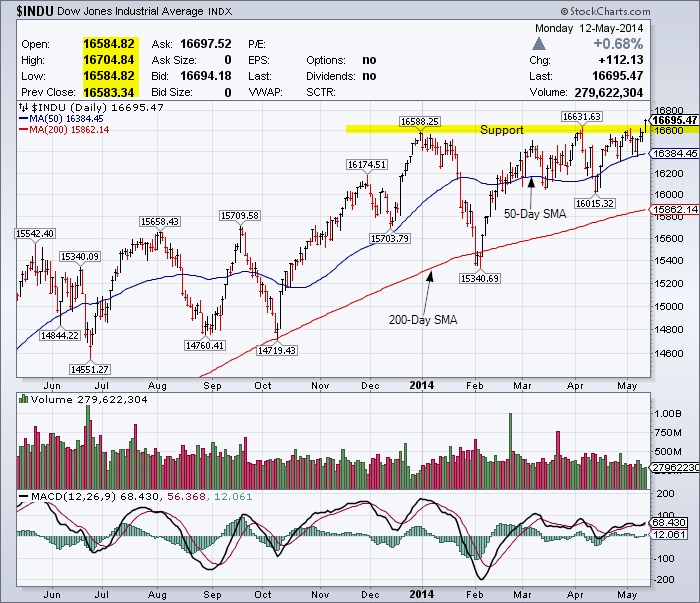 Reference the last chart analysis for the Dow. This entry was posted in U.S. Indexes and tagged chart, DJIA, support, Technical Analysis on May 12, 2014 by Trader.